Who Coined The Term "Personal Computer"? The term “personal computer”, or “PC”, has become a staple of our everyday life, but have you ever wondered where exactly that term came from? There are many terms and phrases in our every day life that you never think about where they came from. One of the best known is about “drinking the kool-aid” to mean you’ve bought into a school of thought. This comes from the Jonestown mass suicide in the 1970’s where the entire religious cult committed suicide by drinking fruit punch (it was actually Flavor-Aid, but Kool-Aid is better known) laced with cyanide. So we got the term “drinking the kool-aid” to mean you believed in something blindly like a cult. Yes, while not exactly a perky example, it does show that something can work its way into our every day vernacular without much thought as to where it came from. While PCs has been a term that has just always seemed to exist, it has to have an origin, and it isn’t exactly a glamorous one. In 1970, Henry Edward Roberts, better known as Ed Roberts, founded a company named Micro Instrumentation and Telemetry Systems (MITS). Dr. Roberts was an entrepreneur, engineer and medical doctor that saw a need for better calculators, and that is what he set about making at first. While his device was a major success, he started to find his company in financial trouble due to an increasingly vicious calculator pricing war. 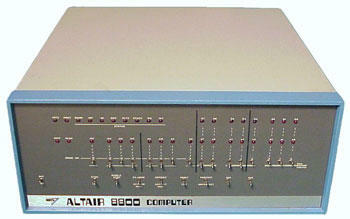 In 1974 he decided to build a device around Intel’s new 8080 microprocessor, and thus was born the Altair 8800. The behemoth device covered in switches was featured on the cover of the Jan. 1975 issue of Popular Electronics, and the company was flooded with orders for the kit. Somewhere in this time period, when Bill Gates and Paul Allen worked on Altair BASIC, and made the first sale for their fledgling company “Micro-Soft”, Dr. Roberts was faced with an issue of what to call the Altair 8800 in a print ad. Computers were still known at this time as giant machines that filled entire rooms, so how could he describe something that, while mainly for hobbyists, could easily fit in someone’s home and was meant for personal use? You have to wonder if it was a “eureka!” moment, or if he just thought he had come up with an easy term when he merged all the details into the term “personal computer”.